Oriental City, Colindale’s very own China Town in a shopping centre, shut down in 2008, taking with it not only the games arcade where I became a dance-dance machine champion but also its much-loved food court. 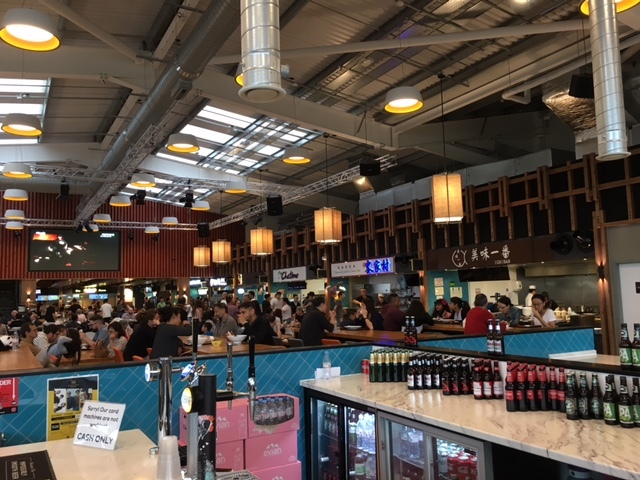 While Colindale may seem like an unlikely home to one of London’s newest and most exciting food markets, in what was once Oriental City’s place now stands a newly rebuilt and re-branded food hall – Bang Bang Oriental food hall. Hosting 33 stalls from all over the Asian continent, Bang Bang is a far cry from its run-down but well-loved predecesor. This newly rebuilt food court is impeccably clean and well laid out, with all the food stalls set on the edge of a large hall. The variety of stalls include Vietnamese, Malaysian, Korean and a huge mix of regional Chinese cuisine. 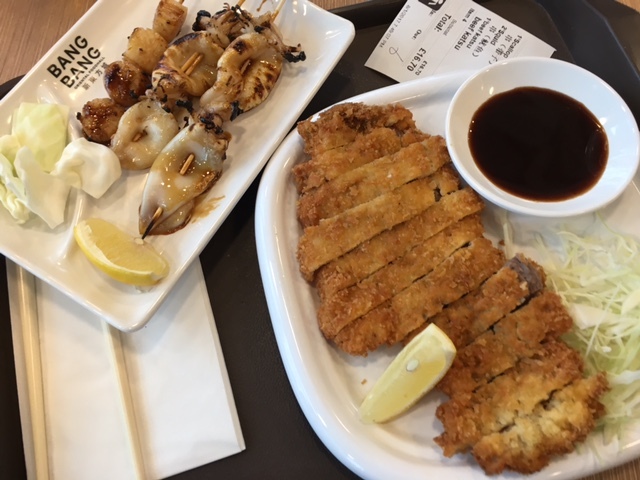 Visiting for the first time with my family, everyone had a preference: a plate of roast duck for mum, some seafood noodle dumplings for my sister and a beef cutlet katsu for my dad. My requests for chicken feet and tripe noodle soup were sadly rejected, but you can’t blame an offal enthusiast for trying. As you order from different stalls, you receive a buzzer, which eagerly vibrates once your food is ready. Hold onto your receipt for each purchase, as you trade this in along with your buzzer when you go to collect your plate. The nature of having different vendors means receiving all dishes at once is unlikely, but it’s actually quite nice to go trying each plate as it comes and spreading out the meal. My dad felt a little disappointed with his katsu, as the sauce came separately and was more breaded beef fillet than curry. I thought the batter was nicely crispy and not too oily, although the meat was tough. We ordered cuttlefish skewers which had a wonderfully smokey flavor, but they needed to be eaten quickly before the squid turned rubbery. 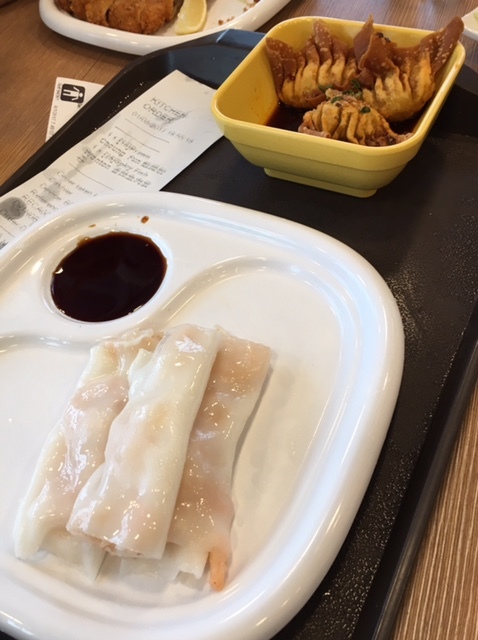 These hand pulled noodle dumplings where a success; they had a smooth, gelatinous texture with a fresh and light prawn filling. The fried seafood dumplings were like an oriental-flavored onion bhaji, so had very little about them to not love. 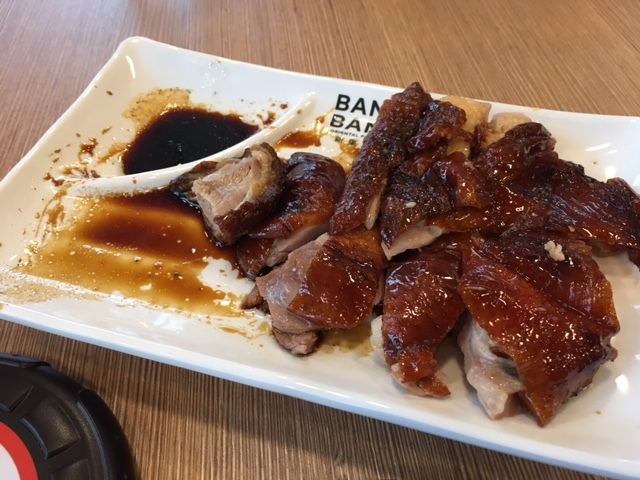 I’d give the star plate badge to the roast duck – deliciously rich with a thick layer of soft fat nuzzled under the crispy skin, this was by far my favorite dish. While all these plates sated our savory hunger, of course we still had our dessert stomachs to fill. My sister and I set off to explore and were lured in by the Wonderful Patisserie stall, which smelled like baked cookies and bread – not a taro or bean curd bun in sight. We went for a Taiwanese bubble tea, which I insisted we ordered with custard rather than the traditional tapioca balls. My moment of madness paid off, as the chunks of custard went surprisingly well against the creamy yet not overly sweet black tea beverage. 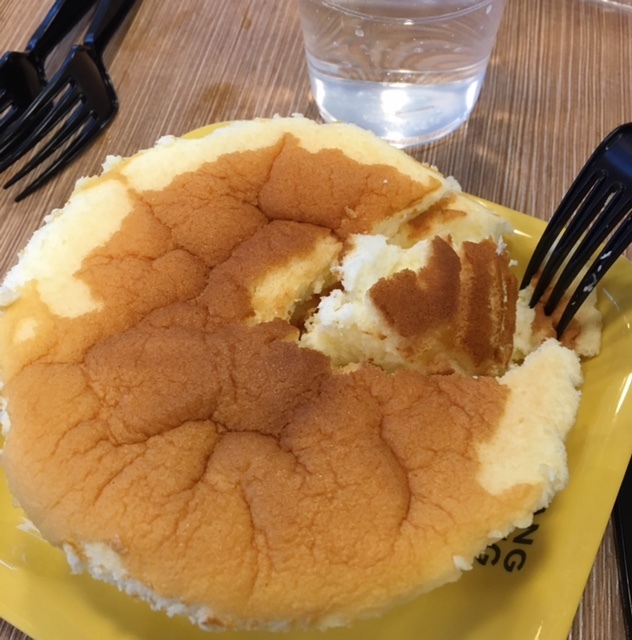 Doubting that our parents would share our enthusiasm for this cold, textured tea, we took a chance with a Japanese cheesecake. I’d watched videos of these being made with whisked egg whites to create a cake which is now much loved the world over, so thought it’d be something to try. With no biscuit base, this spongy, light cake was a perfect end to such a rich and varied meal. Although it was structurally rather sound with minimal wobble, the smooth and airy texture was a welcome change from the heavy and rich traditional cheesecake, and between four this was a perfect pudding. Given that Bang Bang Food Hall is now a 50 minute commute from my new Clapham North home, the fact I’m keen to soon return is testament to its attraction. If you’ve never had a reason to visit this Edgware-bound end of the Northern Line, you’re in for a treat. So venture into Zone 3 and arrive hungry, and preferably in a large group. Order everything and don’t skip the duck. You can even visit the RAF museum after (and who says Colindale isn’t great? ).